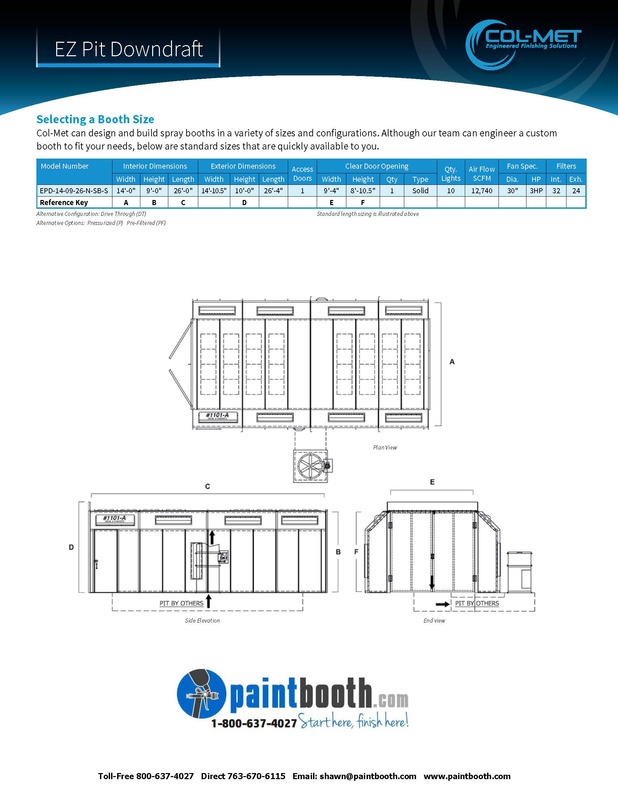 Full downdraft paint booths are by far the most popular booths among automotive refinishers and manufactures. In this model the entire ceiling of the cabin is filtered with quality diffusion media. This insures only the cleanest air in the cabin. 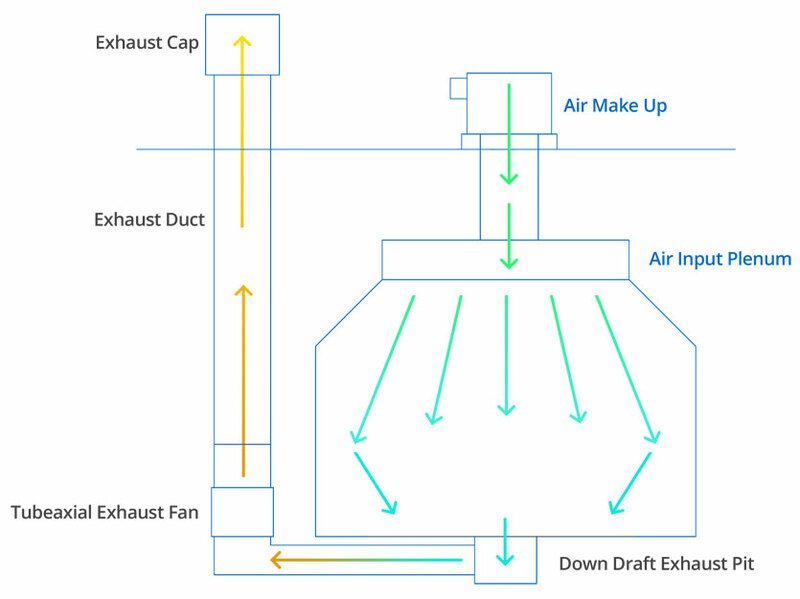 The air enters from ceiling intake filters, then the clean air is drawn straight down around the parts being painted and through a set of filters under the floor grating where the overspray is trapped and the filtered air exits into the atmosphere. This process ensures a superior work environment, controls overspray and reduces prep time. 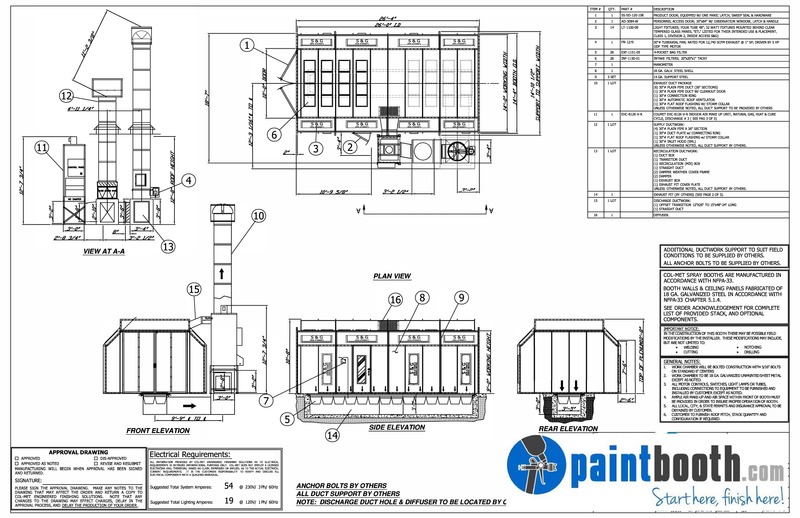 Our full downdraft paint booth line is offered in a several standard sizes and configurations, which include pressurized, non-pressurized, solid back, reverse flow and drive thru designs. 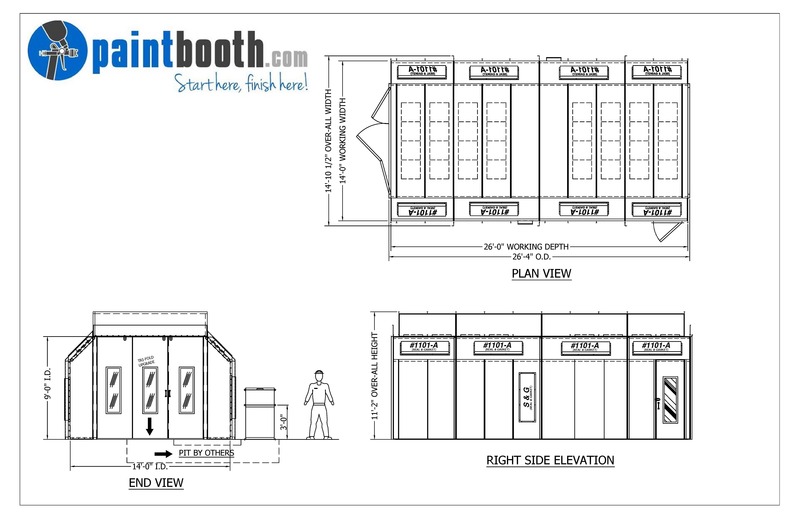 Construction Booths are constructed from 18-gauge, quality galvanized steel. All supports and panels are CNC punched for easy nut and bolt assembly. Product doors are field hung on slotted hinges to aid in adjustment on two axes for uneven floors. Our standard 36″ wide personnel door has an observation window and is set into pre-assembled heavy duty frame. Booth Lighting comes standard with 4-tube, 48″ long, 32-watt, fluorescent light fixtures. They are ETL listed (Class 1 Division 2) Inside Access and are supplied with multi voltage ballasts to accept any voltage between 120V and 277V power. Fans & Motors are quality U.S. made brand-name tube-axial fans and motors. Air Solenoid Valve Interlocked to the exhaust fan and air supply for the spray application equipment. Performance Standards meet or exceed all applicable OSHA and NFPA regulations. ETL-Listed control panels are options on many of our booths. 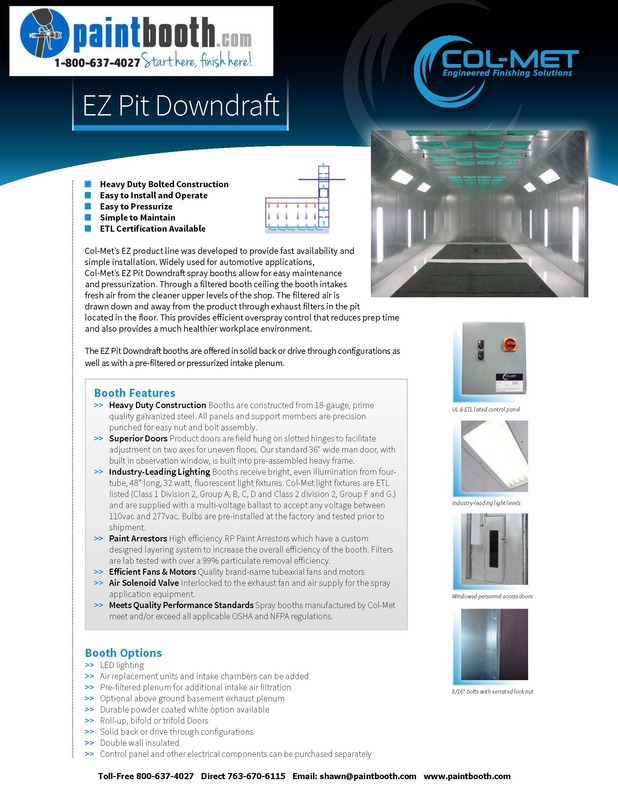 Our factory trained installation crew can get your new Full Downdraft Paint Booth installed correctly and quickly. This our specialty! You can rest assured that your new equipment will be operational in no time. The sizes listed below are standard catalog sizes. We can custom build all of our finishing equipment to meet your needs. Call us at 800-637-4027. This normally pressurized booth intakes fresh air from the cleaner upper levels of the shop through a full ceiling filter bank. The filtered air is drawn down through the booth to an exhaust filter system located in the pit in the booth’s floor under the parts being painted. One of the most important details not to be overlooked in a paint booth is the lighting. Our booths feature industry superior lighting with four-tube, 48″ long, 32-watt, fluorescent light fixtures. They are ETL listed (Class 1 Division 2) inside access and are supplied with multi-voltage ballasts to accept any voltage between 120V and 277V power. Bulbs are included. 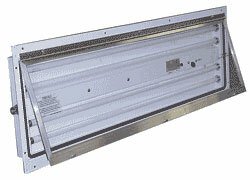 LED light fixtures are an option that can be easily integrated into any existing spray booth or fixture. To find out more about LED light fixtures, please click here. Our products meet and/or exceed all applicable OSHA and NFPA regulations. They are also ETL- Listed with purchase of optional control panel or heated air make up unit, which comes standard with a control panel.